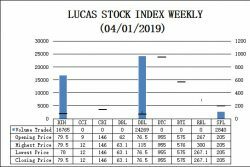 The Lucas Stock Index (LSI) remained unchanged during the third period of trading in March, 2019. 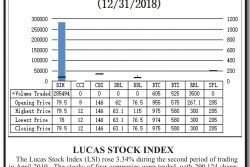 The stocks of four companies were traded, with 82,991 shares changing hands. There were no Climbers and no Tumblers. 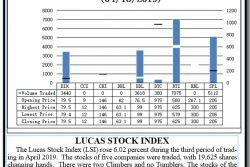 The stocks of Demerara Distillers Limited (DDL), Banks DIH (DIH), Sterling Products Limited (SPL) and the Demerara Tobacco Company (DTC) remained unchanged on the sale of 74,356 shares, 5,830 shares, 2,605 shares and 200 shares, respectively. 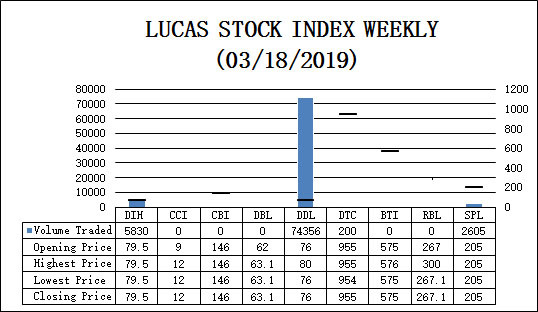 The LSI closed at 529.44.